You can buy some office products for their home because at Staples Canada nobody pays for shipping. When you spend $45 or more you can benefit this options. So you can buy extra-large workstations for good price than any other retailer. Ergonomic office chairs, mesh seating computer desks and more are waiting for you you to be discovered. Stretch your money more than ever with them. 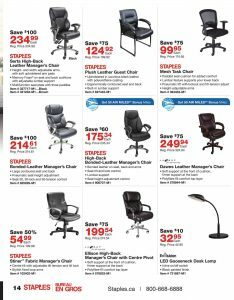 Also you can browse special opportunities on Staples Canada Flyer March 1 2017. Find good prices on this flyer, browse time limited savings, new products and clearance outlet. They have super deals for March. Click and see best deals. In addition , when you are shopping at their stores , you can earn Air Miles reward miles ! You shouldn’t miss their special opportunities. Let’s browse what you have on this week. For more details and information , don’t forget browsing all pages of this special flyer.